Straight Through Processing (STP) refers to a process of execution of forex trades where the trader’s orders emanate from the trading station, and are routed straight from there towards the interbank market, where the orders are executed. The market/execution venue, which is the interbank market where the big banks play the role of liquidity providers. This is actually where currencies are offered for sale on a wholesale basis. The pathway/connecting entity, which in this case is the STP broker. The originating entity for the FX orders, which in this case is the trading station of the forex trader. 1 What are the Advantages of an STP Broker? 5 What’s the Difference Between ECN vs STP Broker? 6 How Can You Tell a True STP From a False STP Broker? What are the Advantages of an STP Broker? There is no conflict of interest in the process. STP brokers are not dealers (market makers). They do not take opposing sides of their clients’ trades as is done in dealing desk arrangements. STP brokers are only interested in the spreads made from trading, as well as commissions charged on certain assets. Dealers acting as counterparties benefit directly from the losses of their clients, so there is a huge incentive for a dealing desk broker to ensure that their traders lose money. This is not a factor with STP brokers, so traders benefit from a situation of zero conflict of interest. Dealing desk brokers and hybrid brokers hold two liquidity buckets known as the “A book” and the “B book”. The A book is where profitable clients are kept, for STP execution. Majority of retail traders will find themselves in the B book. Any trader who remains consistently profitable will be kicked out of the B book and get sent to the A book. This will present a change in market conditions, as a trader with a profitable algorithm that has been built to work with B book conditions will find that such as algorithm will not work in the A book bucket. This poses problems for traders. But with an STP broker, the trader is not sent to the B book from the get-go, so there will be no need to worry about getting kicked out for being too profitable. STP brokers accommodate traders with all trading styles. Scalpers are especially welcome as their frequent trades generate income in spreads and commissions for STP brokers. Hybrid brokers and dealing desk brokers tend to frown at scalping and may end up penalizing the trader. STP brokers provide direct market access and more transparent pricing. Pricing with dealing desk operators is very opaque, especially when it comes to execution of the stop loss. With an STP broker, pricing seen on the platform is the actual pricing received from the interbank market. So there are no slippages and requotes. Here is a list containing the best 10 STP forex brokers of 2019. This list has been carefully curated to take the stress of looking for a true STP broker from off you. International Capital Markets (IC Markets) is an Australian forex broker, regulated by the Australian Securities and Investment Commission (ASIC) with AFSL No. 335692. The broker operates a STP (ECN model) system and provides a free VPS to its funded live account holders. The company works with some of the biggest liquidity providers in the game. Commerzbank, HSBC, Credit Suisse, RBS, Bank of America, Morgan Stanley and JP Morgan are just some of the LPs the company works with. Its order matching engine located at the Equinix NY4 New York data centre allows for some of the fastest executions you can get in the FX market. Leverage remains non-restrictive at 1:500. Fast executions due to its order matching at Equinix NY4. Free forex VPS for funded live account holders. Spreads are variable and can widen considerably during news trades. Vantage FX is another Australian STP (ECN model) broker that uses a bridge technology to deliver its STP executions. Licensed with AFSL number 428901, Vantage FX provides a robust educational suite as well as free forex tools such as smart trader tools, sentiment analysis and access to Trading Central technical analysis and a free forex VPS for holders of funded live accounts. Leverage remains non-restrictive at 1:200. Transparent pricing from top-tier liquidity providers. Lightning fast execution with no conflicts on interest. STP offering is not suited for beginners. Global Prime is a regulated Australian broker that has an STP offering in addition to its market maker offering. Traders who want to go the STP route with this broker have to open a special STP trading account, which also provides access to the interbank market via several professionally-oriented trading platforms. ProTrader3, PrimeXM, FlexTrade and Skout make up the trading platforms and technology suite that provide for algorithmic trade development on web and mobile (ProTrader3) and a proprietary FIX engine which sources liquidity within NY4 (Skout). PrimeXM uses the MT4 Bridge with a FIX compliant interface, while FlexTrade provides multi-asset trading within the FX market using an institutional-level GUI/API. Fast executions and ultra-low latency due to its order matching facility at Equinix NY4. Algorithmic strategy development using AlgoStudio. Various FX assets, including non-delivery forwards (NDF) can be traded on the STP offering. Darwinex is an FCA-regulated brokerage, with license number 586466. The company prides itself as one of the few STP brokers that provide some additional benefits not found in other STP brokerages. One of the unique selling points of Darwinex is data protection. It believes in protection of trading strategies of its clients being protected from illegal copying and even outright theft. Darwinex never ceases to mention that transparency is its watchword. Traders can access third-party capital through a legal means unique to the company. Supplementary trader insurance worth £500,000, which is 10 times more than FSCS limit of £50,000. Darwinex operates a Community Forum where DARWIN data analyses and strategies can be shared by investors and traders. Traders can share in 4.5million euros prize money via the DarwinIA Trading Challenge. Website content and layout is not very user-friendly. Beginners will find it a bit difficult to use the site and services. At 77%, rate of loss for CFD trading is relatively high. LMAX Global is a UK-based STP broker which is part of the LMAX Global Group. The company also doubles as a technology provider for institutional firms that are actively looking to stay ahead of the competition. LMAX is regulated by the FCA with license number 783200. LMAX Global has relationships with many liquidity providers and also provides tools for reporting on trading activity. Some of its software are open source, and provide a total package that includes trading, technology and reporting facilities. LMAX is ideally suited for well capitalized retail traders who want to make the jump into STP trading, armed with the same tools that institutions and professional traders deploy in their FX trading endeavours. FCA-regulated brokerage and technology provider. Suited for professionals and institutions who also want cutting edge technology support for better and faster executions of their trades. Timely and quality executions with no “last look” rejection of trade orders. LMAX offers its clients complete trade anonymity for buyers and sellers. Low latency execution for clients, which is a huge advantage for large volume trading. LMAX is not suited for beginners. You actually have to pay to use the platform and technology products. You also incur a fee for account dormancy: $50 a month for retail accounts and $100 a month for corporate accounts. FXOpen opened its doors in 2004 and was one of the first retail brokers to offer an STP ECN offering using its proprietary MT4 bridge software. FXOpen UK also provides a low entry barrier for traders who want to use the ECN offering, and the commission rates per Standard Lot are very competitive. FXOpen UK is FCA-regulated with license number 579202. The company provides several tools that make trading as hitch-free as possible. Minimum account deposit starts from $300. Level 2 market depth quotes are provided. Trader insurance worth £50,000 is provided via membership of FSCS. Trader education resources are very sparse. At 78%, rate of loss for CFD trading is relatively high. 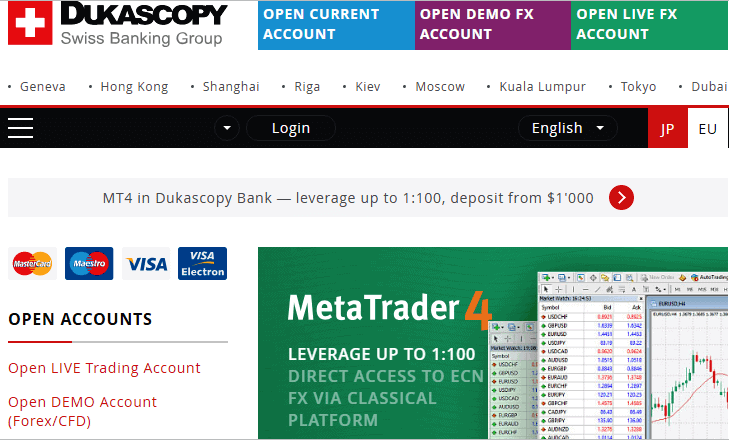 Dukascopy is a Swiss online brokerage/bank that offers an STP ECN execution using its proprietary Swiss FX Marketplace. SWFX is connected to 20 liquidity providers via its web-based trading application and mobile apps. Dukascopy is regulated by FINMA, the financial regulator of Switzerland. However, the company also has offices in Riga, Kiev, Moscow, Dubai and Tokyo, which encourages localiszation of its product offering in those regions. Leverage for trading of FX and CFD on ECN ranges from 1:20 and is capped at 1:200. Leverage adjustments are only possible by contacting the account manager. However, exotic currency pairs have a margin requirement of 10% (i.e.1:10 leverage). Dukascopy has some of the best trader education materials in the market. Lots of value-added services which include the famous Dukascopy TV station. Equal access to market depth monitor for all traders. Many jurisdictions were unfairly locked out by a regulatory ruling some years ago, causing many trading accounts to be closed summarily. Restrictive leverage on exotic FX pairs (1:10). The London Capital Group is a hybrid brokerage which has a market maker division and also offers an STP ECN brokerage model for its highly capitalized clients. Operating the STP ECN with London Capital Group requires a minimum of $10,000. Access to the interbank market is provided via the proprietary LCGTrader as well as an MT4 Bridge. LCG Trader is regulated and authorized in both the UK and in Cyprus. Access to the STP product has to be initiated by putting a call across to the company. An account manager will then be assigned to the trader, and steps to open the ECN account will be provided. Spreads typically start at 0 pips for the EUR/USD, but with leverage starting at 1:50 to 1:200, commissions are charged on the buy and sell side of trades. Trader insurance worth £50,000 is provided via membership of FSCS. Similar insurance is available via CySEC’s Investor Protection Fund. A robust trader education suite is provided, enabling new traders get some education as to how the markets work. Spreads may start from 0, but these are variable and can widen considerably during news trades. STP offering is available only for traders with deep pockets (minimum balance of $10,000). GAIN Capital UK provides trades with access to over 12,500 FX, CFD and Options markets via a single trading connection or via its API. The company is a provider of deep liquidity, connecting traders using the ECN model to the interbank market, acting as a prime broker. The company has recently announced a rebranding strategy which will see it offering the STP trading model. This will require operating an institutional account, as the company wants to use this offering to target traders at the high end of the market. Provides JAVA and FIX APIs for its STP ECN trading model. GAIN Capital UK provides out of market hours trading for many assets, so you can trade some CFDs even when the markets are closed. STP offering will be available only for professional traders and those with deep pockets. FxPro UK offers its clients STP/ECN executions, providing them with the cTrader platform. FxPro is one of those brokers that have a different offering for its UK and international clients. Traders who use the ECN product in the UK and EU pay commissions on trades in addition to the spreads charged. Access to the Financial Ombudsman Service of faster dispute resolution. The forex market presently has a daily turnover of about $5.3trillion a day, making it the biggest financial market in the world. Initially, the trading volume was generated by banks and other institutional entities. This was because the forex market was (and still is) a market which requires lots of money to trade. Movements of currencies are very small: usually in the order of 4 decimal places (the 5th decimal is a tenth of the 4th decimal), or 0.0001 points. The unit of change in currency prices is one pip or 0.0001 points. Therefore, a large amount of money is needed to transform these minute pip movements into reasonable monetary quantities. The monetary requirements for FX trading are far beyond the reach of individual traders. This is why prior to 2005, the concept of Straight Through Processing was not possible. The technology did not allow it and the retail trading numbers at the time could not generate the volume required to maintain the needed liquidity within the system. But as technology improved, STP became possible. It is important to understand the market structure and how Straight Through Processing actually works. What goes on behind the scenes in a Straight Through Processing setup? Brokerage operations are run with a front end (visible to the trader) and a back-end (not visible to the trader). Technically speaking, orders and executions occur between the trader and the interbank market. But the process is more complex than this. In an STP brokerage operation, the STP broker receives the price feeds from the liquidity providers and passes these on to the trader, sometimes with a small markup. However, the STP broker is not expected to assume risk by being the counterparty. They are therefore required to hedge the position that they have passed on to the trader by taking an opposite position with the liquidity provider. The snapshot below shows how the process works. We will assume that the trader wants to go long on the GBP/USD. The trader BUYS the GBP/USD. The STP broker will SELL the GBP/USD to the trader as fulfillment to the trader’s BUY position. The STP broker must hedge their SELL position to the trader by opening an opposite order (i.e. a BUY GBP/USD position) with a liquidity provider (LP) in the interbank market. An LP in the interbank market will SELL the GBP/USD to the STP broker as fufilment of the STP broker’s BUY order. In this manner, the STP broker is actually acting as an intermediary between the buyer and the interbank market. The net result is that the trader is BUYING the currency asset which the interbank market is SELLING, with the STP broker creating the intervening balance that ensures that the transaction occurs and is executed. Unlike the in-house execution that the dealing desk “brokers” (i.e. market makers or dealers) offer, execution with an STP broker is done at the level of the interbank market. So the market acts as the counterparty while the STP broker is purely an intermediary. STP brokers typically take no risk. As has been demonstrated above, they help the trader get pricing and order executions at the interbank market, but never get involved in executions themselves. What’s the Difference Between ECN vs STP Broker? Using the ECN model of operations, the STP broker works with an ECN. The ECN is basically an aggregating engine that pools the best prices for currency pairs from various banks and sends them as one single price to the STP broker. The STP broker then feeds this ECN price to the trader, who has an option of either accepting the price or rejecting it. In the DMA model, a single price feed is derived from the interbank market, and this is fed to the trader exactly as it is, without any markup by the STP broker. 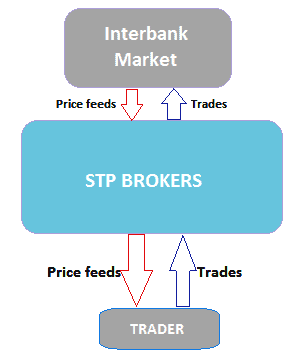 In the same vein, the trader’s order is sent straight from the trading engine/portal to the interbank market via the STP broker, without any alteration in price. Therefore, there are no requotes or slippages whatsoever. There has always been a question of which model of brokerage business is ethically right or wrong. The truth is that none of the models operational in the market can be said to be right or wrong. Rather, it is a matter of incentives, conditions and any obvious advantages or disadvantages. It must also be mentioned that apart from the DMA model, markup of prices that arrive at the trader’s trading engine is possible, and this is usually in the form of widened spreads. That is why the STP model usually offers variable spreads, as opposed to the fixed spreads found in the dealing desk brokerage models. Depending on the trader’s trade objectives, widened spreads may not be very desirable, especially during news trades. There are some minute differences in both models, even though the net effect is the same. How Can You Tell a True STP From a False STP Broker? One of the many traps that traders fall into is that of trading with a hybrid broker, or trading with a market maker that is masquerading as an STP broker. These days, we are seeing a lot of brokers claiming to be ECN or STP brokers, when in fact they are market makers. So how can you tell who is a true STP broker and who isn’t? Here is one way to do this. A true STP broker must have the classification of “Dealing with Investments as an Agent”. If a broker has the appellation: “Dealing with Investments as a Principal”, then this broker is not an STP but actually a dealing desk broker. There is an exception to this rule. 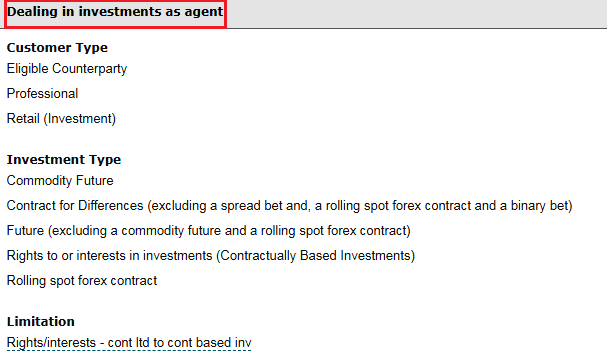 Some forex brokers may be permitted to do both (i.e. deal with investments both as an agent and as a principal), but there must be a matched-principal limitation or restriction by the regulator. This limitation prevents the broker from taking risks (i.e. acting as a counterparty to their clients’ trades). The broker must take an opposing position from the interbank market as described earlier in this article to counter this risk. So next time you see a broker posing as an STP broker, do not take their word for it. Always check things out for yourself. This has been a compilation of our Best 10 STP Forex Brokers for 2019. We have taken time to compile this list so you do not have to start searching for them yourself. This list also ensures that you actually trade with true STP brokers, and not impostors who claim to be STP but are actually dealers. What is the difference an STP forex broker and a dealing desk broker? STP brokers channel their clients’ trades to the interbank FX market. After fulfilling a trader’s order, they are required to hedge that position in the interbank market so that they take no risk. This way, STP brokers do not profit from taking opposite sides of their losing clients’ trades. Market makers on the other hand, handle all executions in-house. Their clients’ orders never reach the interbank market. After fulfilling their clients’ orders, dealing desk brokers assume full risk by not hedging the trades in the interbank market. They therefore assume the opposite sides of the client’s trade from start to finish. In a nutshell, STP brokers fulfill clients’ orders at the interbank market, while dealing desk brokers fulfill all orders in-house. Is it expensive to trade with an STP broker? Some STP forex brokers require a large amount of money to open and operate an STP trading account. Furthermore, traders pay a commission to enter and exit a trade, as well as pay the spreads on the asset price upfront. So technically speaking, trading with STP is more expensive than trading under dealing desk conditions. Are STP and ECN the same thing? STP is not the same as ECN. ECN is a system where prices of different liquidity providers are aggregated into a single price, which is then fed to the STP broker’s clients. ALL ECN brokers use STP, but not all STP brokers use ECN. Are the spreads on STP fixed? Typically, spreads on STP brokerages are variable; widening during volatile periods and narrowing when the markets are quiet. Does STP have any advantage over dealing desk conditions? The main advantage is the elimination of conflict of interest. STP brokers have no incentive to work against you or offer you bad pricing. However, dealing desk brokers benefit directly from the losing positions of their clients, so a conflict of interest exists. Where are most STP brokers located? STP forex brokers are found in the UK, EU and Asia. Setup of an STP structure is expensive, which is why many brokers in low-cost setup environments such as the Caribbean do not offer STP. Can I use my forex VPS on an STP broker? Some STP brokers offer an MT4 bridge, and even permit the use of a forex VPS. We have discussed one or two of such brokers above. What is a typical position size in STP forex trading? This depends on the broker. Some allow position sizes of as low as 0.01 lots, while others (especially those that attend to traders with high net-worth may limit the minimum order to 1 standard lot. STP stands for ‘Straight Through Processing’ a reference to how STP brokers handle their clients’ orders in the market. What is the FX interbank market? The interbank market is a virtual financial market where big banks gather to buy and sell currencies to each other and to brokerages. These banks are also known as liquidity providers. What are the top liquidity providers in forex?